Earners of this badge have built a working chatbot application by using IBM Watson Conversation and the Weather Company Data service. To build this app, earners understand key concepts such as intents, entities, and dialog flow. They also know how to work with the app declaratively and programmatically by using the Watson SDK for Node.js. 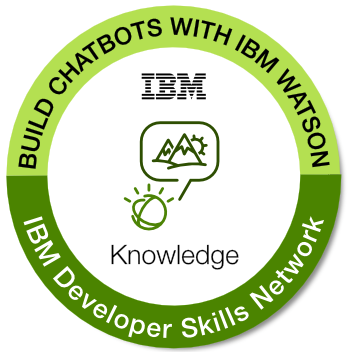 Completion of the developerWorks course "Chatbots and Watson: let's talk about national parks". Passing the in-course assessments with a score of 80% or higher.